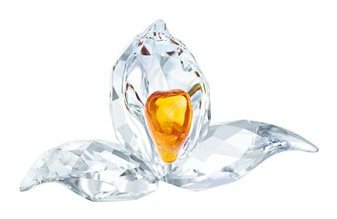 Swarovski Crystal information, news, collectors club and Swarovski price guide. Swarovski crystal began in 1892, when Daniel Swarovski, the son a Bohemian-born gemcutter, invented the first industrial crystal-cutting machine. The quality of the material and the precision of his cut soon earned him an international reputation. Pictured: The Membership Gift for 2018 is the SCS African Orchid. Membership benefits include an annual Swarovski crystal gift which for 2018 is the African Orchid, subscription to the quarterly Swarovski magazine, invitations to local and international SCS events, workshops and Crystal Journeys, a personalized membership card, free admission to the Swarovski Kristallwelten in Wattens (including special treatment in the Swarovski VIP Lounge), and the ability to purchase SCS members only editions and specials. 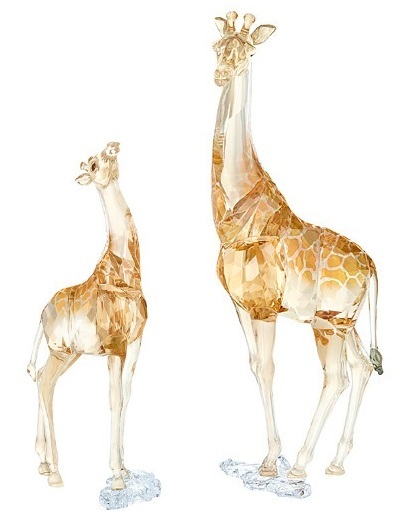 The 2018 SCS Annual Editions are Giraffe Mudiwa and Giraffe Baby, once again both designed by Martin Zendron. Imagine yourself on the burnt umber plains of Africa’s Serengeti Park with this beautiful depiction of a Giraffe, the SCS Annual Edition for 2018. Sparkling with 651 facets of expertly-cut crystal, it features a special fading effect to emulate the graceful fur pattern of the animal. The design has been titled Mudiwa, which means ‘beloved one’ in the Africa language of Shona. The base of the piece is engraved with this name, the Swarovski logo, the designer Martin Zendron’s initials, and 2018, the year of issue. Combine this beautiful Giraffe Baby with the SCS Annual Edition 2018 Giraffe Mudiwa to create an emotional and heart-warming family scene for your collection. Sparkling with 461 facets, it features a special fading effect to emulate the graceful fur pattern of a giraffe. Exclusively available in 2018 to SCS members only. NOTICE – This site is not affiliated with the Daniel Swarovski Coproration TM. The purpose of these pages is to provide information to collectors of Swarovski Silver Crystal.